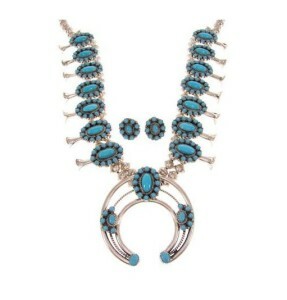 When thinking about jewelry of the Navajos, the squash blossom necklace is sure to come to mind. It conjures up thoughts of classic tales from ancient native history. The Navajo squash blossom necklace has a rich history that runs to places even farther than the Navajo soil. In defining the history of the Navajo squash blossom necklace, it is important to dissect the necklace into its parts: the pendant or Naja, the squash blossom beads, the stones, and the silver. Each has ties and markers from different parts of history. The crescent-shaped pendant of the Navajo squash blossom necklace is called the Naja. Southwestern Indians would first have seen this shape on the bridles of the Spanish Conquistadors, as far back as the late 1500s, when they were made of iron. The Naja were also worn as pendants long before being placed in Navajo squash blossom necklaces, and began to be seen as such on native Americans in the 1800s, when they were associated with fertility rites. Owing to the prominence of squash as a food in Indian life, there is a temptation to attribute the bead to this meaning. In fact the literal translation of the word for these beads, yo ne maze disya gi, means “bead that spreads out” and is descriptive rather than reflective of the squash blossom. The name squash blossom was applied later to the Navajo squash blossom necklace, as it began to gain prominence in the late 1800s. Prior to 1860 there was little indigenous silver work by the Navajo and other tribes. Navajo tribes credit a man they called Herrero (“the smith”) as the first Navajo silversmith. Reportedly, after 1858 he learned silver-smithing from a Mexican named Casilio. Navajo and other tribes used Mexican and American coins for silver. After 1880 silversmiths began to make the Navajo squash blossom necklaces, often from these coins. Ornate turquoise, coral and other semi-precious stones seen decorating the Navajo squash blossom necklace are sure to indicate a more modern necklace, as this is a development from the twentieth century. It is a misnomer to say “Navajo” squash blossom necklace, as there are also Zuni and Pueblo squash blossom necklaces as well. The Navajo squash blossom necklace is truly an Indian creation with roots that run back to the Spanish Moors of the 1500s. Slowly the image that began with the Moorish conquests transformed into a symbol of fertility and combined with the squash blossom to become a symbol of fertility, then prestige in both the native culture and in modern America. The Navajo squash blossom necklace rose to popularity in part due to popular American culture of the 1970s and continues so today. The Navajo squash blossom necklace maintains its place in tribal ceremony and culture.